The 2017 Hyundai Ioniq is a range of new subcompact hatchbacks offering a choice of hybrid, plug-in hybrid, and all-electric powertrains. The 2017 Ioniq lineup is expected to go on sale at the beginning of 2017. The ecologically focused Ioniq models offer a range of propulsion options. Whether the buyer wants an electric car that never needs gas or a hybrid that never needs to be plugged in or something in between, there is an Ioniq for him or her. The Ioniq Hybrid is designed for the driver who wants to pull up to the filling station just as with a traditional car. The hybrid cannot be plugged in, so there is no worry of running out of electric charge, and Hyundai said the range is outstanding, though no specific number of miles were cited. The key feature is that emissions are low and fuel efficiency is outstanding, according to Hyundai. 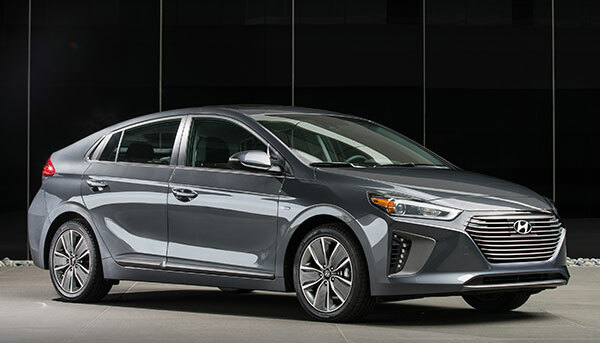 The Ioniq Hybrid combines a 32kW electric motor and 1.56kWh battery with a 1.6-liter four-cylinder engine with direct fuel injection, all of which adds up to an estimated 139 horsepower. The Ioniq Plug-in Hybrid combines these two strategies. Plug it in, charge it up, and it will offer an estimated all-electric range of more than 25 miles, according to Hyundai. Once that 25 miles is used up, the gasoline engine kicks in, eliminating range anxiety. Ioniq Plug-in Hybrid owners who live within 10 miles of work can go for long periods of time without stopping at a gas station, or perhaps use the engine only minimally each day. The Plug-in Hybrid is powered by a 45kW electric motor and 8.9 kWh battery coupled with the same 1.6 four-cylinder engine that the Hybrid uses. Ioniq Hybrid and Ioniq Plug-in Hybrid will come with a 6-epeed dual-clutch transmission, which will work like an automatic but perform like a manual. That is in contrast to most hybrid-powered cars, which use continuously variable transmissions with snowmobile-like accelerator response. Ioniq’s environmentally friendly design does not end with the drivetrain. As with all modern cars, the Ioniq has an aerodynamically designed body, in this case achieving a 0.24 coefficient of drag that Hyundai said is class-leading. Recycled materials are used in the interior. The interior door panels are made of volcanic stone and powdered wood. Oil-based products are minimized. Soybean oil is used to make metallic-looking interior paint. Weight is minimized by using aluminum in the hood and tailgate. Ioniq will come with the latest in infotainment and connectivity.